San Franciscans use a different voting system—and it’s way better. Here’s why. Most San Franciscans probably don’t realize that something on their ballot is revolutionary. It’s not a candidate or a ballot proposition—it’s a a style of voting. If you’re not that interested in the mechanics of voting, I hear you. My favorite political subjects are meatier, spicier, juicier—insert-your-favorite-food-metaphor-here. But more often than I’d like, the most transformative policies aren’t about banning some terribly corrupt behavior or exposing some nefarious wrongdoing. They’re about changing rules that, in turn, change the incentives of political elites. Give every voter a small voucher they can only spend on elections, and—surprise, surprise—politicians suddenly engage way more with typical voters, not just big-money donors. Move all elections to the same day (rather than staggering them across the year), and turnout is higher—which means small, engaged interest groups have less say over election outcomes. Political scientists and policy geeks like me call these institutional reforms. Back in 2002, San Francisco voters bypassed the city council (we call it the “Board of Supervisors”) and passed one themselves. The reform is called “ranked choice voting,” or RCV. You can read a million and one explanations of RCV online, but I’ll spare you that less-than-thrilling Google search. 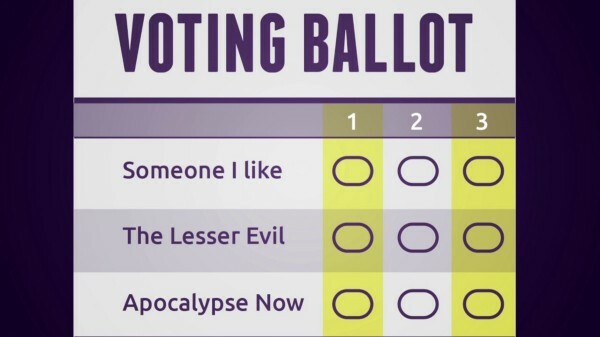 Basically, ranked choice voting is exactly what it says. Instead of choosing one candidate, you rank your choices: first place, second place, and third place. Here’s how the rankings get used. The vote-counters in City Hall (hello, you guys! keep up the good work!) count up all the first-place votes, and one of the candidates comes in last. Say it’s the person that you put at the top of your list, the person you really want to win. Under an old-school voting system, that’s it; your vote was essentially wasted. In fact, it hurt the chances of your second-place candidate.They‘re more popular and have a better chance of winning the overall election, but you used up your vote on someone else. So, back to the world with RCV. Your favorite candidate came in last; that’s sad. However, it’s not that sad, because RCV has a solution. The good ol’ vote-counters at City Hall tally up the votes. If no one is a clear winner (i.e. gets more than 50% of the vote), they drop the candidate who got the lowest number of first-place votes. Your vote wasn’t wasted! You didn’t jeopardize the chances of your next-favorite candidate! It’s basically like you had a chance to come back to the voting booth and say, “OK, my favorite person isn’t in the running anymore, so here’s my next choice.” But by ranking people up-front, you save a trip, and the city saves money from not having to hold a second (or third, or fourth) election. Politicians normally like to hate on each other during elections. Not so with RCV. The famous (and somewhat conservative, FWIW) political scientist Larry Diamond explains it this way: “Because candidates must try to win the second and third preference votes of their opponents in order to win, elections with ranked-choice voting tend to produce less vitriol and negative advertising.” Yes, please. You can see this at work in the recent elections in Santa Fe, New Mexico, which used ranked-choice voting for the first time this year. According to Santa Fe voters, this year’s mayoral candidates—the ones running under an RCV system—used language that was way more more positive than candidates who ran under the old voting system. Given the national trend toward more negative campaigning, this is a huge accomplishment. If you’re like me, you have strong political opinions that generally align with one party—but you also think that the political establishment gets a lot of stuff wrong. In the old voting system, fresh faces are scared to run, because they don’t want to pull votes away from establishment candidates, split the vote, and end up helping elect someone from the opposing party. Not a problem with RCV. People can run for office without hurting candidates they generally agree with. In fact, those candidates can cross-endorse each other—which basically means saying, “Vote for me as your first-place candidate, and vote for my friend in the Democratic/Republican Party as your second-place choice.” In fact, this exact thing is happening in San Francisco’s mayoral race right now. This follows from the last section. Third parties generally don’t work in the US; people know that Democrats and Republicans almost always win elections, so they don’t want to waste their votes on anyone else. But because RCV lets people vote for whoever they want without “spoiling” the election, the whole narrative changes. Journalists stop calling third-party candidates “spoilers” and start thinking of them as viable alternatives. And once third-party candidates get taken seriously, so do their ideas. Goodbye, two-party duopoly; hello, choices. See what I mean about the power of institutional reforms? You change one little thing, and suddenly, politics starts looking a whole lot different. Once you get that basic fact, you start questioning everything. What would happen if we voted on weekends instead of Tuesdays? Increased the budget for Congressional staff? Or, my personal favorite, elected multiple people to represent each district? If you’re excited about RCV and other transformative reforms, I highly recommend checking out FairVote and Represent.Us, two national groups that are working tirelessly to fix America’s broken political system. You could even bring RCV to the city or town where you live! You can find more info at http://fairvote.org/ and http://represent.us/. Finally, if you find this all fascinating, there is a whole world of election science out there that explores a bunch of alternative voting systems, including—but not limited to—RCV. You can learn about some of the most popular systems here. But fair warning: the more you learn about this stuff, the more likely you are to bore the hell out of your friends at dinner parties. Don’t say I didn’t warn you. Quick note: I wear a lot of hats, including serving as a board member of both FairVote and Represent.Us and as a commissioner on the San Francisco Elections Commission. This piece solely expresses my own views and not the views of the SF Elections Commission.